It’s now ready for collection and erection at a forest school outdoor classroom. Rather a challenge and like all things got easier as I went along – the one meter stretch was a breeze. Still working on the small charcoal kiln, and getting ready for making Bedouin tents with some school children (cue making mallets, tent pegs, buying tarpaulin etc.). And worrying about a day with 28 Saudi students coming up after that, just realised I need some chairs, well I guess it will have to be logs on end! Very dry still, driest for 40 years apparently, doesn’t make it easy to choose nice wet sycamore for spatula carving practice that I’ll be doing with the students. 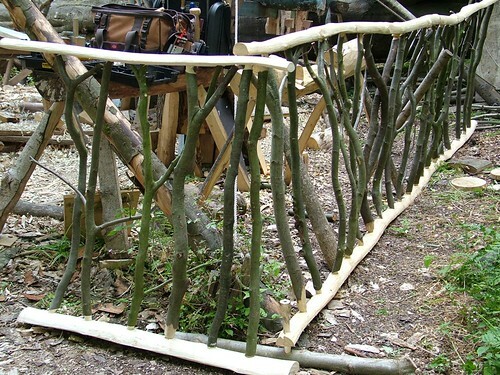 This entry was posted in Green woodwork and tagged balustrade, charcoal by Flying Shavings. Bookmark the permalink.